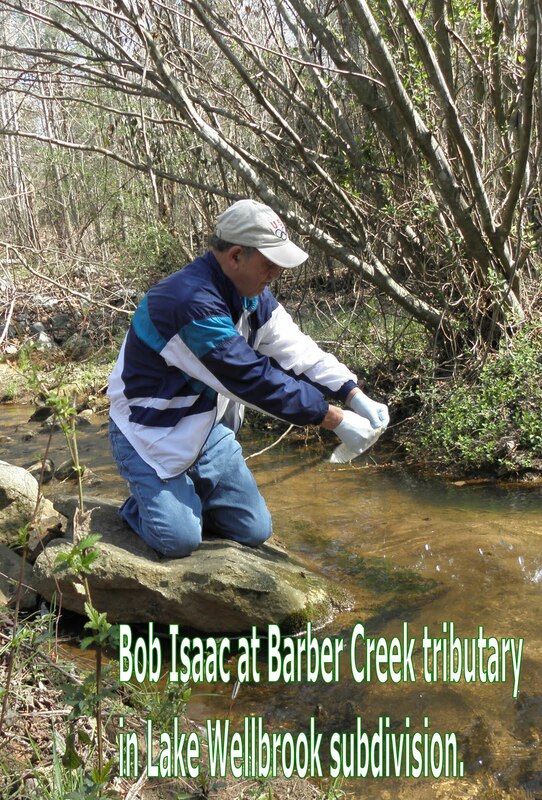 Volunteers organized by Friends of Barber Creek drew water samples and filed descriptive reports on nine sites on Barber Creek and its tributaries for the Upper Oconee Watershed Network 13th Annual River Rendezvous today. The samples gathered will be analyzed to give a picture of the quality of the water in the streams and to be compared with data from previous samplings. UOWN has limited data on Oconee County streams from the past and made a push to get more volunteers involved in the event today. Tim Price and I, vice president and president of Friends of Barber Creek, were joined by Cathy Jackson, Janie Price, Bob Isaac and David Jackson in drawing samples and describing the nine sites. Tim and I attended the training session at the start of the day and then joined the others to create three, two-person teams to visit the sites, all located where roads cross the streams. Included were three sites in the western part of the county: Barber Creek at Clotfelter road, a tributary to Barber Creek at Rocky Branch road and Barber Creek at Malcolm Bridge road. Four sites on Mars Hill road were sampled: a tributary of Barber Creek near the QuikTrip under construction at the Mars Hill road and Daniells Bridge road intersection, Barber Creek where it is crossed by Mars Hill road, Parker Branch of Barber Creek near Crooked Creek road and a Barber Creek tributary crossed by Mars Hill road near the blocked entrance to the undeveloped Parkside subdivision. The final two sites were where Daniells Bridge road crosses Barber Creek and on the tributary of Barber Creek that feeds Lake Wellbrook just before the lake is formed in LakeWellbrook subdivision, which is off Daniells Bridge road. At each site, the team drew two water samples and completed a form providing data on clarity of the water, amount of algae, signs of erosion of the banks, amount of litter, and other site and stream characteristics. UOWN has four additional sites on Barber Creek designated for sampling, one near the Barrow County line and three near where Barber Creek joins McNutt Creek, but we didn’t have time to include them today. Tim and I returned the samples to the Nature Center at 1 p.m.
OUWN also has sites on Calls Creek in Oconee County designated for sampling and was prepared to send volunteers to Rose Creek, but no other Oconee County volunteers were able to join the rendezvous today. The Oconee County sites are in Zone 3 of the Middle Oconee region of UOWN. UOWN, formed in 2000, is dedicated to protecting water resources and improving stream health in the Upper Oconee watershed through community-based advocacy, monitoring and education.